vision forum: OPEN CALL FOR VIDEO ART! OPEN CALL FOR VIDEO ART! Verkstad in Norrköping is looking for video art to be presented at the global art phenomenon BYOB – Bring Your Own Beamer, which will be held at Verkstad 8th of February 2013. The idea is simple: bring your video, a media player and a projector and we will fix a wonderful evening of art, projections and music together. 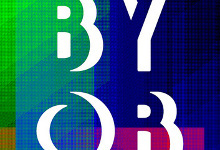 BYOB is a series of one-night-exhibitions curated by different people around the world. The pieces could be long, short, with or without sound, with moving or non moving images as long as you are willing to share the space with other pieces! Send an email to verkstadkonst (at) gmail.com if you are interested to participate with your piece! BYOB is a way of making a huge show with zero budget. It is also an exploration of the medium of projection. BYOB is a celebration of the new world we live in and a glimpse of what computing could look like in the future. Today the internet is confined to screens. Tomorrow information will surround us, composing our surfaces, defining our spaces, enmeshing itself with the ether. A moving image is never an object, and when it is coupled with the increased flexibility of portable projection, the realm of experience quickly expands. BYOB is an idea by Rafaël Rozendaal. The first edition of BYOB was initiated by Anne de Vries and Rafael Rozendaal in Berlin. BYOB is an acronym for “Bring Your Own Beamer”. In Europe projectors are often referred to as “beamers”.